Indiecade will be returning to E3 once again, and will be showcasing 34 independent titles. “HOHOKUM [PlayStation 4] by: (Presented by SCEA) developed by Honeyslug for PS4, PS3, and PS Vita, Hohokum is an expressive and mesmerizing universe where players take on the role of a curious flying kite-like being. Brought to life by the imaginative artwork of Richard Hogg and an entrancing original soundtrack from talented artists in collaboration with Ghostly International, players will embark on a big game of hide and seek to explore vibrant worlds and discover their secrets to find each of their friends and unlock new levels. COUNTERSPY [PlayStation 4, PlayStation 3, PS Vita, Mobile] by: (Presented by SCEA) from upstart indie studio Dynamighty comes CounterSpy, a new side-scrolling stealth shooter for PS4, PS3, PS Vita, and mobile platforms. Combining the spy mythology and bold aesthetics of the 1950’s and 1960’s and set during the Cold War, CounterSpy puts players in a rogue third spy agency, C.O.U.N.T.E.R., tasked with infiltrating military bases in search of launch plans needed to stop world superpowers from blowing up the moon! HOTLINE MIAMI 2: WRONG NUMBER [PlayStation 4] by: (Presented by SCEA) the brutal conclusion to a gruesome saga, Hotline Miami 2: Wrong Number follows the escalating level of violence through multiple factions born from the events of the original game. Switch between several distinct characters and factions – each with their own motivations and methods of execution – as story lines intersect and reality slips away into a haze of neon and carnage. Blistering combat, an unmistakable visual style, and a powerfully intense soundtrack that will once again push you to the limit and have you questioning your own thirst for blood. THRALLED [OUYA Exclusive] by Team Thralled: (Presented by OUYA) Thralled follows the journey of a young woman named Isaura, a slave traumatized by the disappearance of her child and tormented by memories of an agonizing past. After years living under oppression, she escapes and takes to the thick forest to locate her lost son. TOTO TEMPLE DELUXE [OUYA Exclusive] by Juicy Beast: (Presented by OUYA) From the makers of Knightmare Tower, Toto Temple Deluxe is a 2D platforming local-multiplayer game where up to 4 players must hold on to a goat for as long as possible, while their friends jump and dash around trying to knock it out of their hands. SO MANY ME [OUYA, PC] by Extend Interactive: (Presented by OUYA) a new innovative twist on puzzle solving and platforming with a charming 2D art style. The game stars Filo and his band of misfit clones as they attempt to save a world threatened by an ancient, malevolent evil. ROAD NOT TAKEN [PlayStation 4, PS Vita, PC, MAC] by Spry Fox: an original puzzle about life’s surprises where players adventure through a vast, ever-changing forest in the aftermath of a brutal winter storm. FRACT-OSC [PC/Console] by Phosfiend Systems: a musical exploration game where the player explores a vast landscape of an abandoned world that was once built on sound. FRACT features a beautiful open world to explore and decipher with music-based puzzles, stunning visuals, and an amazing score that evolves as you play. WHAT?!? OH… [Table] by Games Without Strings: What?!? Oh… started as a simple, experimental mechanic where players could generate a conversation simply by playing back and forth phrase cards from their hand. Randomly chosen Starter Emotions, Settings, and Comments start the game with a laugh and a concrete scene, and ensure that no conversation is ever the same twice. DREI [Mobile] by Etter Studio: Three builders have to work together to build a tower in a game about skill, logic and collaboration. The game connects players across the world to help each other in the battle against gravity. LONG TAKE [PC/Console] by Turtle Cream: A platformer that is not a platformer. A player that isn’t really the player. In Long Take, you play as a cameraman who must keep the hero inside of the viewfinder to record a cool gameplay video. GROW [Table] by Chris Hasssebrook: A 3-dimensional strategy game where 2-4 players compete to become the dominant flower color on an abstract tree. Key mechanics include territorial acquisition, a 3-Dimensional modular board, route building, and a light simulation that mimics the growth of an actual tree. SLAP .45 [Table] by Gnarwhal Studios: takes three of life’s most fundamental elements (slapping, westerns and making rash decisions) and turns them into a card game. When a card is drawn, every player acts simultaneously to shoot each other or jump to cover. The winners will need to have quick wits and even quicker hands to be proclaimed the fastest slap in the west. PROJECT HEERA: DIAMOND HEIST [PC, PS4, Xbox One] by Mazhlele: A top-down, team-based multiplayer game that pits players as thieves or cops in a battle over who can steal or defend diamonds. HACK N SLASH [PC/Console] by Double Fine: A puzzle action game about hacking where players reprogram object properties, hijack global variables, hack creature behavior, and even rewrite the game’s code. With advanced hacking mastery, players can dive directly into the game’s assembly in the form of procedurally generated dungeons and modify the live-running code. CELESTIA [PC, MAC] by Yang Shi and Cheng Yang: a vocal interaction game where the player guides a newborn star through the universe by singing different pitches/notes to help the star absorb satellites and fend off treacherous threats in her journey of stellar evolution. BLOOM – The Game [Installation] by Plethora Project: Commissioned by the Greater London Authority as part of Wonder series to celebrate Olympics and Paralympics games, ‘Bloom’ is and interactive architectural installation designed and developed by Alisa Andrasek and Jose Sanchez from The Bartlett School of Architecture at UCL, London. The project proposes a crowd-sourced approach for assembly by using game mechanics as part of the design of one unit. This unit (The ‘Bloom Cell’) would be produced in an Array of 60.000 identical copies where proposed for manufacturing allowing and expecting the public to Play and assemble diverse formations. STORY POPS [iPad, iPhone] by Localite Games Inc.: StoryPops empower young readers with a smartphone as a dynamic prop to PLAY with their favorite stories and lets readers enact narrative events or roleplay with characters. CLOSE CASTLES [MAC, PC] by Sirvo: a fast-paced competitive city builder that plays like a fighting game; destroy the opponent’s castle by first building a thriving kingdom. Plop down houses, draw roads to your enemy, and watch your loyal citizens attack! XING: THE LAND BEYOND [PC, Oculus Rift] by White Lotus Interactive: an atmospheric first-person puzzle adventure where players are crossing between life and death, solving environment-based puzzles and gaining/using powers such as Rain and Snow. ANAMNESIS [PC, Oculus] by Studio Guts: a first-person exploration game set in near-future L.A. that is recovering from a deadly virus. You are a FEMA relocation agent visiting a temporary shelter complex in order to find out why some of the tenants have lost contact. The Oculus Rift serves as a secondary display port: the monitor displays the first-person view of the character, but players may bring up the Oculus Rift to their eyes at any time in the game to inspect game objects. In the game’s fiction, these are specially designed goggles that read “psychological imprints” left by people that were previously there, giving players the narrative perspective of the character who lived in the space. Anamnesis uses this technique to explore multiple narrative perspectives, environmental storytelling and the utilization of role-play and ritual in the gameplay process. TETRAGEDDON GAMES [PC, MAC, Flash, iPad, iPhone] by AlienMelon: a digital gallery of “Pop Games” based on our collective cultural taboos, icons, and humor, that encourages players to creatively engage in the creation of itself – it is the internet, in the form of a game, a narration of the dynamic times we are in. please be nice 🙁 [PC/Console] by Aran Koning: a PC game where the players come up with the features. The first player that beats the current version of the game gets to submit a new feature for the next version of the game. After that, we update the game with the suggestion added to the game and then the cycle restarts. CAVE! CAVE! DEUS VIDET [PC/MAC/Linux] by We Are Muesli: a PC/Mac episodic visual novel inspired by the works of 16th century Dutch painter Jheronimus Bosch. Strange things happen in Lisbon Museum when 17-year-old punk rocker and Jedi-wannabe Hoodie meets a weird messenger who seems to know too many things about one of Bosch’s most enigmatic paintings, the Temptation of Saint Anthony triptych. NOVA-111 [PC/MAC/Linux] by Funktronic Labs: a sci-fi themed turn-based adventure game with a twist of real-time action. Navigate your trusty orange science vessel as you voyage through mysterious planets in search for the famed scientists who were lost into the cosmic REAL-TIME vortex. T.R.E.E. [PC, MAC, iOS] by Franz Michael Ressel: a continuous, community-driven art development game where a community works together to grow and shape a tree to be their own over the course of a few days or weeks. CHOICE CHAMBER [PC/Console] by Michael Molinari: a game that allows an audience of any size to play along through an endless series of dangerous chambers, providing feedback that changes how the game evolves in real time. Choice Chamber is designed to be played while being streamed live on Twitch, and anyone watching can participate by simply typing in the chat box. A series of polls ask viewers to vote on certain aspects that alter the game’s progression in real time, or viewers can trigger special events, friendly helpers, and even attack the boss themselves. …and then it rained [Mobile] by Megagon Industries: a minimalist arcade game and an acoustic and visual experience. Set in an abstract world, the player has to catch colored and different sounding rain drops by dragging and reordering matching towers, resulting in a rhythmic and nearly meditative world of sounds and colors. BOUNDEN [Mobile] by Game Oven: a whimsical dancing game with choreography by the Dutch National Ballet. Twist and twirl elegantly, or get entangled with a friend. Holding either end of a phone, you tilt the device around a virtual sphere following a path of rings. MONSTERMATIC [Mobile] by Mico Studio: a new engaging and entirely customizable monster creator for iOS devices. The game’s cartoon style, monsterific personalities, playful atmosphere and wealth of tools assist the player in creating their very own custom monster to play with, interact with, and bring to life through the magic of 3D printing at the click of a button. PAPARAZZI [PC/Console] by Mike Longley: a frantic multiplayer game where two players take the role of either a celebrity or the paparazzi. The paparazzi must take photos of the celebrity, as the celebrity must avoid the paparazzi to reach their limo with some dignity! Indiecade will be partnering up with Sony Computer Entertainment America and Ouya for the showcase. 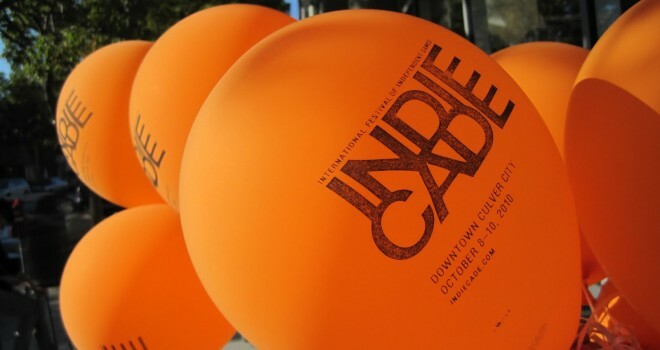 To experience the biggest upcoming indie titles in person, be sure to head to the Indiecade festival that will run from October 9-12 in Culver City, CA.